We're pretty excited about all of these birthdays that have been happening lately. The Google Outreach program just celebrated its first birthday, and Google Maps Street View is happy to also be going one year strong. We're also pleased as punch to wish our pride and joy for geoweb developers everywhere, the Google Maps API, a happy third birthday. It was June 29th, 2005, but it seems like only yesterday that we were marvelling at what context the Gmaps Pedometer was giving us for our running routes or walk to work. Who can forget how many great real estate auctions we were finding with 2RealEstateAuctions? Since then the API has been helping businesses like Ace Hardware map its store locations, and Trulia plot houses for sale. Thanks, Google Maps API, for making all of these great mashups and tools possible! 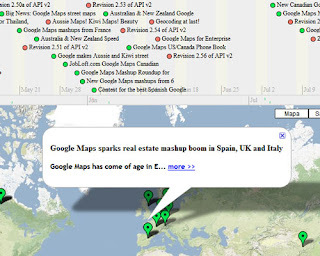 To mark the occasion we've created a timeline mashup of the Google Maps Mania blog, as well as the former Google Maps API Blog (now the Google Geo Developers Blog) to take you on a geolocated journey from June of 2005 to present. It will show you all of the fantastic things that people from all corners of the world have done with the Google Maps API. Stay tuned for a post over on the Geo Developers Blog which will help you to visualize time-based data on maps.